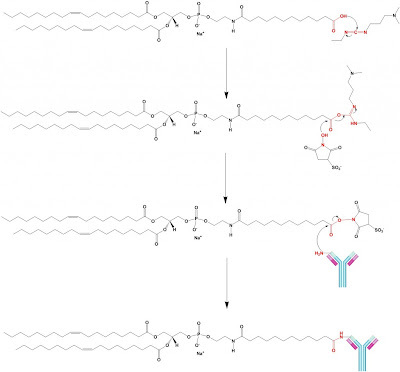 Immunoliposomes are generated by conjugating antibodies either directly to lipid bilayer of liposomes in presence or absence of PEG chains (type I immunoliposomes) or to the distal end of the PEG chain (type II immunoliposomes). 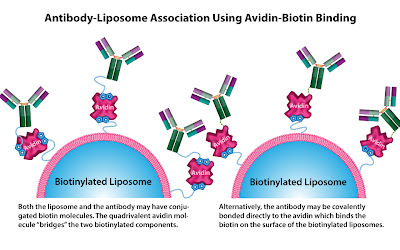 Conjugation of antibodies directly to the lipid bilayer of a PEG containing liposomes (type I immunoliposomes) can result in reduced or even diminishes antigene bonding, depending on the amount of incorporated PEG and the length of the PEG chains. 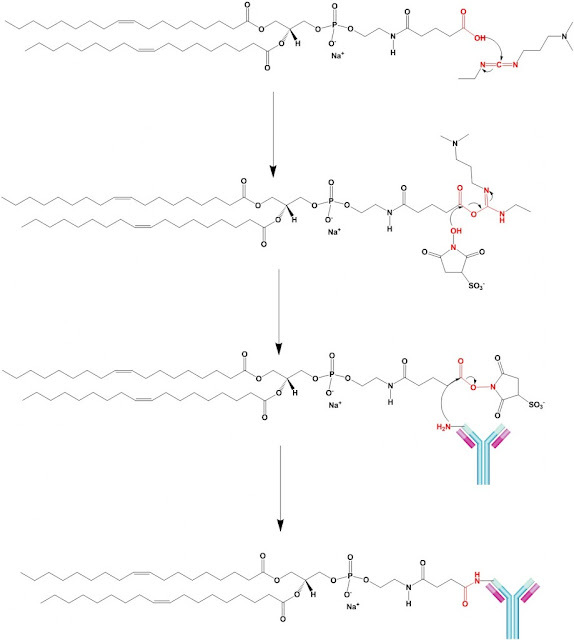 However antigen binding properties of immunoliposomes can be restored by conjugating the antibody to the terminus of the PEG chain and therefore most of the recently developed immunoliposomes are based on type II immunoliposomes. It has been extensively shown that whole antibodies coupled to liposomes are highly immunogenic. 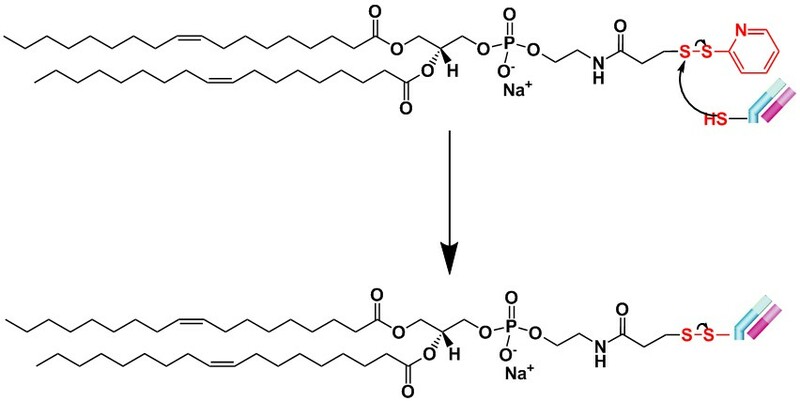 These liposomes are rapidly eliminated through Fc-mediated phagocytosis by macrophages of the liver and spleen, and also by tumor localized macrophages. 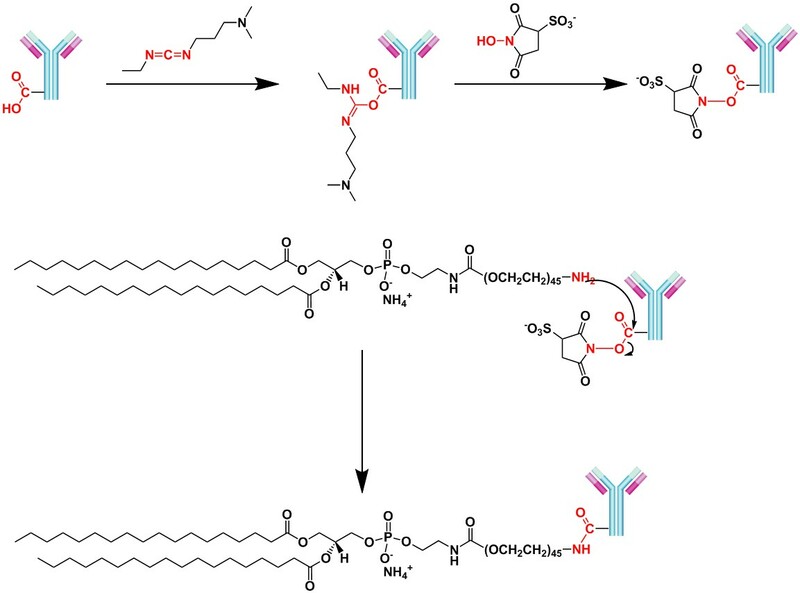 Random coupling methods (eg, using thiolated antibody coupled to maleimide PEG lipids or using modified amino reactive PEG lipids) risk antibody inactivation and liposome aggregation by cross linking. 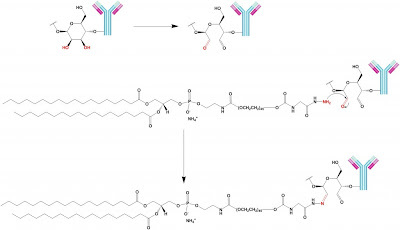 The disadvantages of using whole antibody can be circumvented by the use of antibody fragments such as fragment antigen binding (Fab') or single chain fragment variable (scFv). 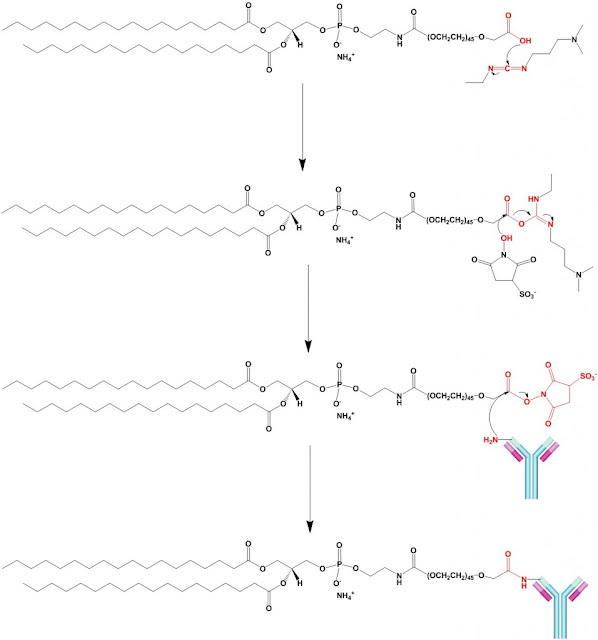 Fab' fragments are generated by pepsin digestion of IgG molecules and subsequent mild reduction. Fab' fragments can also be produced in recombinant form by being expressed in prokaryotic systems. Fab' fragments have an average molecular weight of 50 kDa and expose one or several free sulfhydryl groups, depending on the method of production. Fab' type II immunoliposomes have reduced immunogenicity compared to IgG type II immunoliposomes. IgG type II immunoliposomes are cleared faster than Fab' type II immunoliposomes. A study by Pastorino et al published in Cancer Res (2003) 63 (1):86-92 shows that Fab' type II immunoliposomes have approximately two fold reduced immunogenicity compared with IgG type II immunoliposomes. 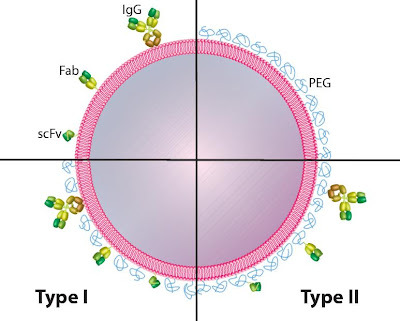 The rate of elimination was three fold faster for IgG type II immunoliposomes compared with Fab' type II immunoliposomes. 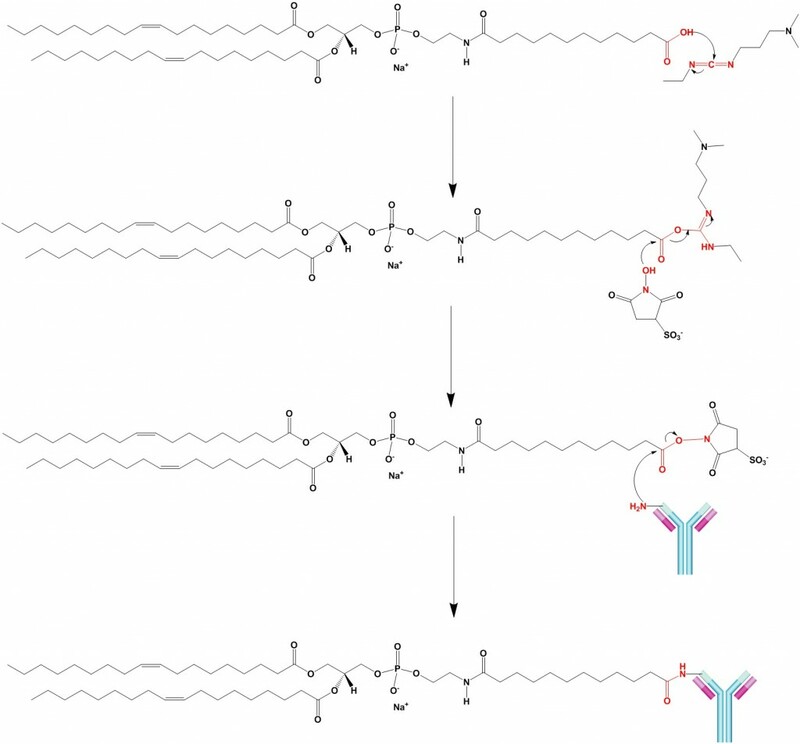 scFv fragments are the smallest fragments to contain the entire antigen binding site of an antibody. 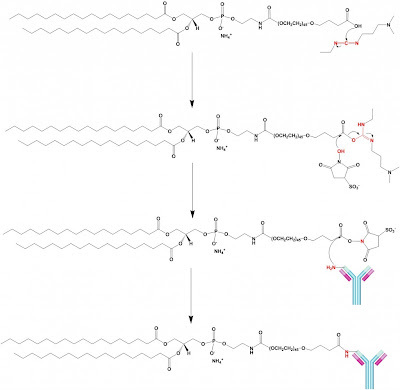 They are formed by connecting the variable heavy and light chain domains with a short peptide linker with 15-20 aminoacids. 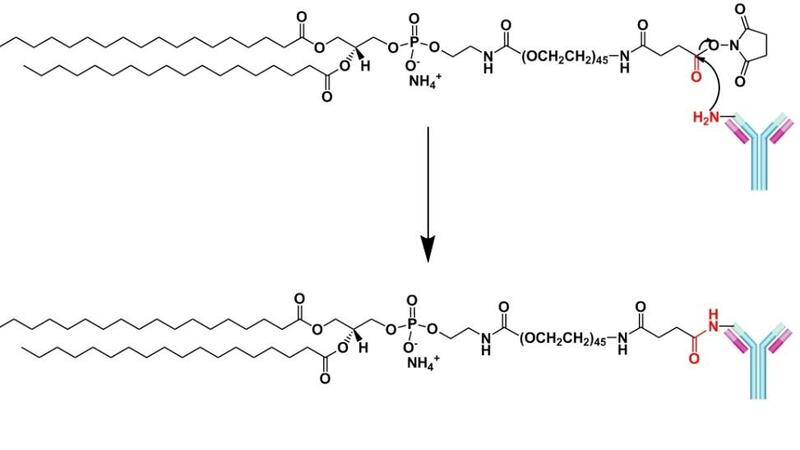 scFv molecules have an average molecular weight of 25 kDa and can be produced in bacteria. 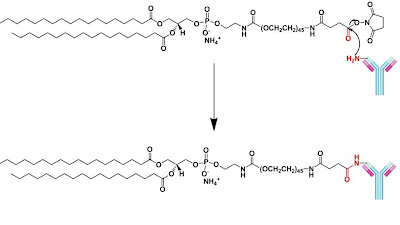 In order to conjugate scFv fragments to liposomes, one or more additional cysteine residues are attached to the C terminus of scFv fragments. 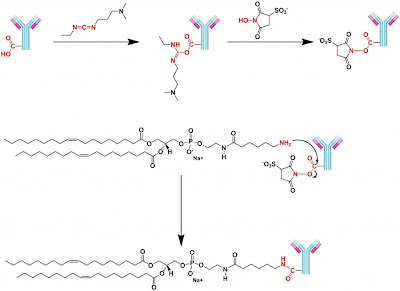 This allows for site-directed conjugation with the reactive sulfhadryl groups located opposite the antigen binding sites and therefore similar to conjugation of Fab' fragments, conjugation of scFv' fragments does not interfere with target cell recognition. Expression of scFv' fragments in bacteria normally results in a mixture of monomeric and dimeric molecules. The dimeric molecules are the oxidation products of two monomeric molecules. 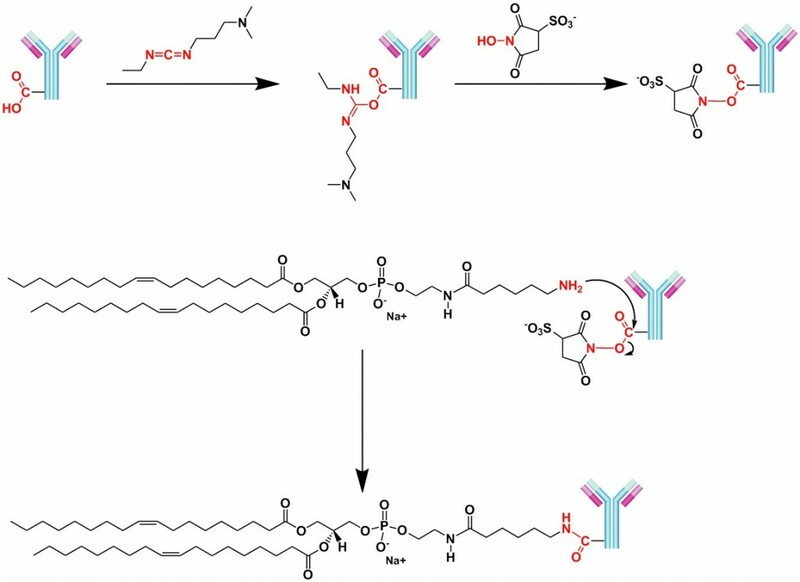 In order to achieve efficient coupling, scFv' preparations have to be reduced under mild conditions prior to conjugation. 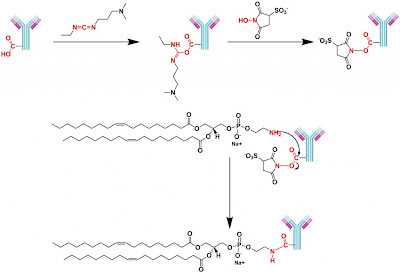 In direct coupling method the liposomes containing reactive groups are formed, and then antibodies and other chemicals are added in order to achieve conjugation. However, direct coupling can result in lower coupling efficiencies. 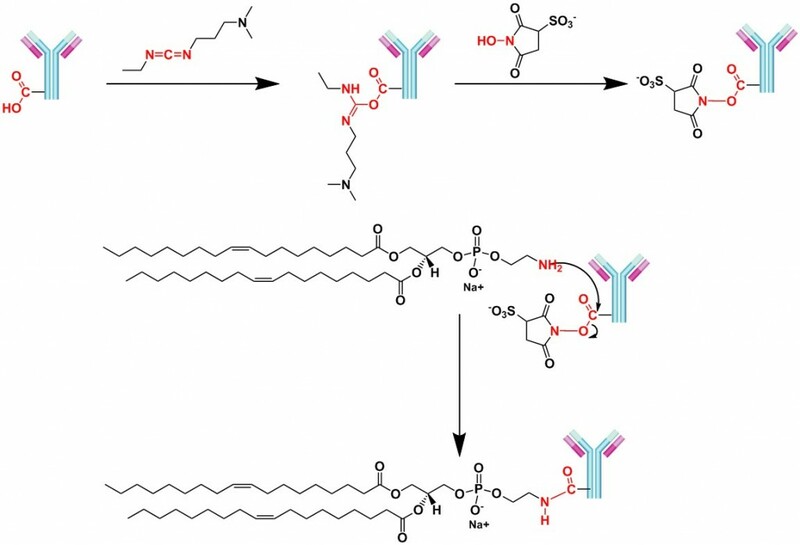 Coupling efficiencies of 20-80 percent was reported when scFv' molecules were directly conjugated to Mal-PEG liposomes. 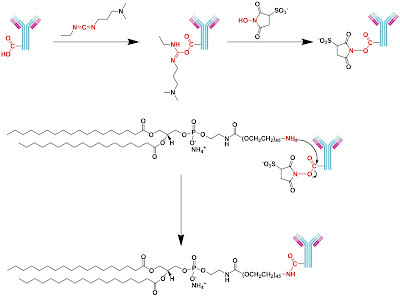 In post insertion method antibodies are first conjugated to Mal-PEG micelles. A study by Nielsen et al. 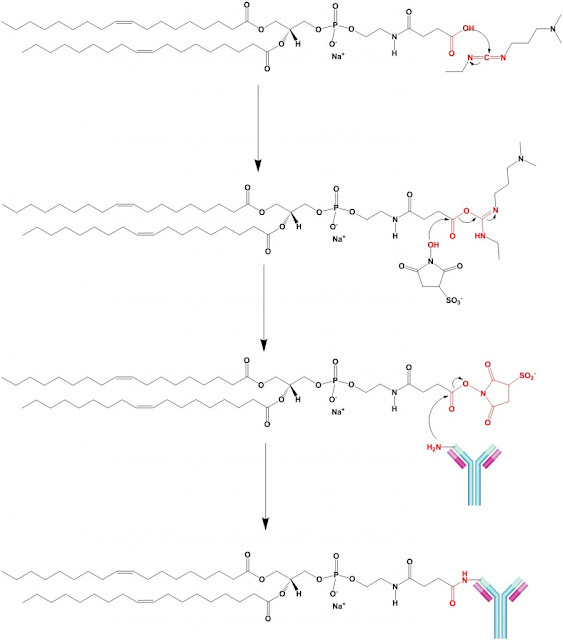 published in Biochim Biophys Acta (2002) 159 (1-3): 109-118 has shown coupling efficiencies up to 95% and preserving more than 80% of immunoreactivity using this method. 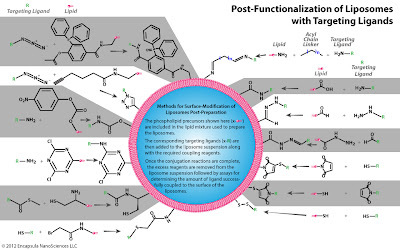 Drug targeting with immunoliposomes is highly complex and influenced by various parameters and both the target site and the liposome. The targeting efficiency of immunoliposomes is influenced by antigen density on the target cells. 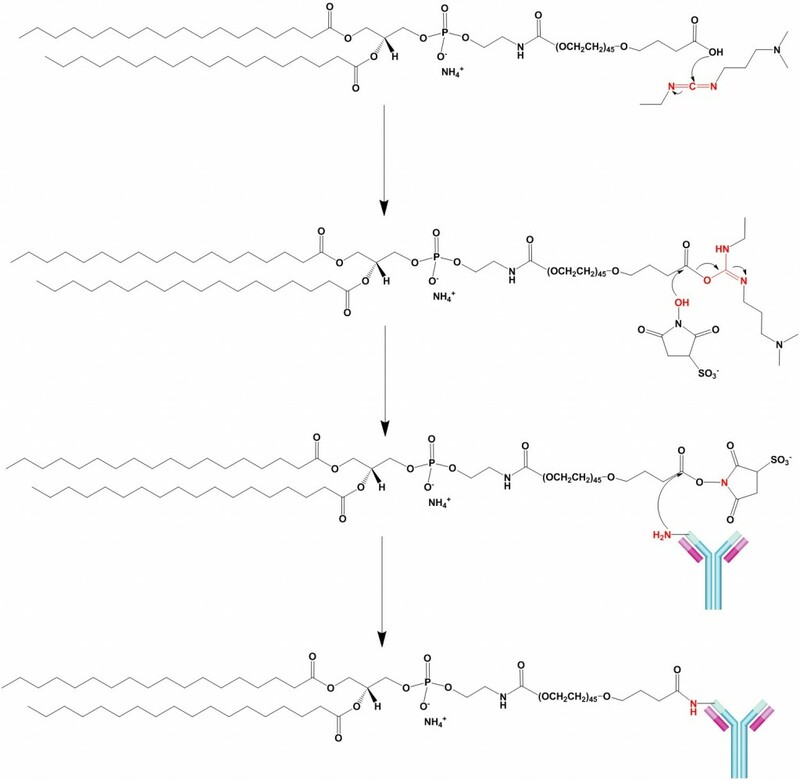 A high density of target antigens increases drug delivery and anti-tumor activity. However, antigen density on target cells is often low. Drug loaded type II immunoliposomes containing antibodies that target an internalized antigen such as CD19 showed much more potency compared to immunoliposomes containing antibodies that target a non internalized antigen such as CD20. 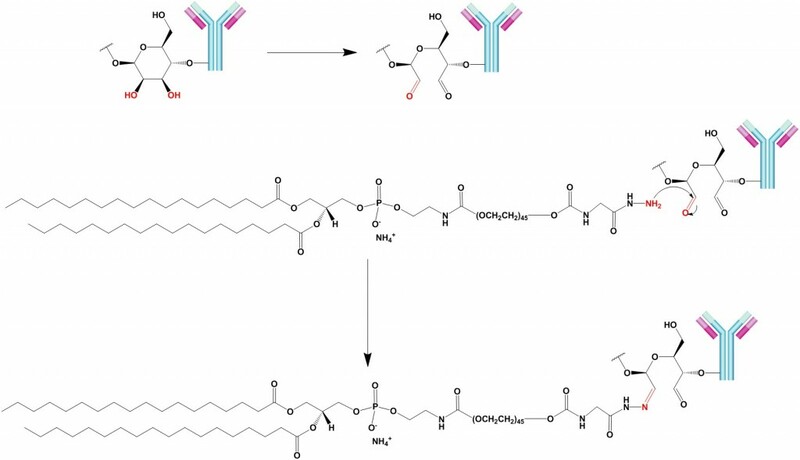 This study shows that internalization of immunoliposomes is a prerequisite for the induction of efficient cytotoxicity. Therapeutic efficacy of immunoliposomes similar to regular liposomes is also dependent on the rate of release of drug and the lipid composition of the liposomes. Unfortunately, the major problem with immunoliposomes is their poor extravasation properties. Extravasation is antibody independent and it is the rate limiting step in the tumor cell targeting of solid tumors. This will restrict the applications of immunoliposomes to those cancers in which tumor cells are readily accessible such as hematological malignancies or minimal residual diseases. To circumvent the problems associated with poor extravasation of immunoliposomes new approaches are developed to combine immunoliposomes with vascular targeting. 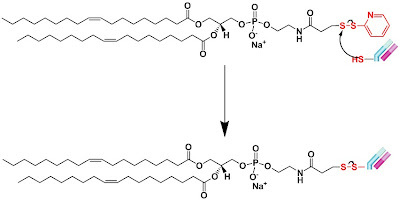 In this approach liposomes are targeted to cells associated with neovascularization in tumor tissue. This is a clever strategy because all solid tumors depend on neovascularization in order to grow and also tumor blood vessels are easily accessible for immunoliposomes. Endothelial cells are genetically stable and should not become resistant to immunoliposomes therapy. Several antibodies and antibody fragments recognize antigens associated with endothelial cell activation and proliferation. These antigens include E-selectin, vascular endothelial growth factor receptor-2, the fibronectin splice variant ED-B, endoglin (CD105), vascular cell adhesion molecule-1 and tumor endothelial marker 1. In vivo study of anti-ED-B scFv immunoliposomes showed 62-90% reduction of tumor growth in F9 teratocarcinoma bearing mice in comparison to animals treated with untargeted control liposomes. If you need to use any of the images in your presentation, dissertation or scientific paper, please contact us at info@encapsula.com so we can release the copyright and provide you with a high resolution image.